Calculate how may retaining wall blocks are needed and how much base and backfill gravel required. Optionally enter cap block dimension to include the cap row in the estimate and enter the price per block to get a cost estimate. Retaining walls can be built using a multitude of materials, but they’re most commonly built using wall blocks or timbers. To estimate retaining wall materials using the calculator simply enter the wall length and width and the preferred block dimensions. If the cap row will use a different style of block then enter those dimensions separately to get an estimate for the cap blocks as well. 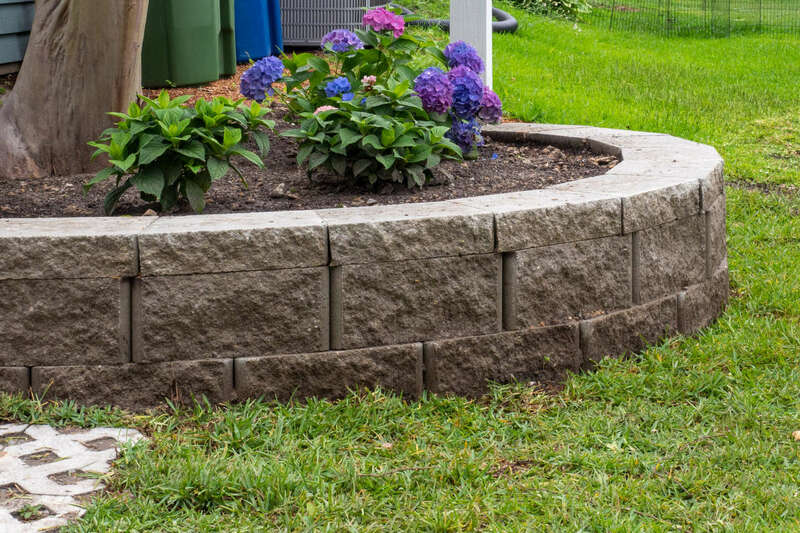 Estimate the retaining wall cost by adding the price per block. For example, you can estimate a 10′ wide by 2′ high retaining wall and observe the materials required. If you’re building a concrete block wall, then check out our concrete block calculator. Estimating the number of retaining wall blocks you need requires estimating the number of rows and columns that are needed for the wall. Start by measuring the wall width and height. We recommend embedding the first course of blocks below grade about 10% of the wall height to support the wall correctly. If the desired wall height is 6 feet, the wall should be embedded below grade by 7-8 inches. Be sure to account for this when measuring the height of the wall. Divide the width of the wall in inches by the width of the block and round up, this is the number of columns. Divide the height of the wall in inches by the height of the block and round up, this is the number of rows. If the top row will be a cap block, then the number of cap blocks needed is the number of columns. To find the total number of blocks needed for the wall simply multiply the number of columns by the number of rows; don’t forget to subtract a row if using cap blocks. Ordering additional retaining wall materials, including blocks and cap blocks is a good idea to account for waste or bad material. We recommend ordering an additional 10% of materials to accommodate this. Don’t forget to account for embedding the first course of blocks below grade when measuring the desired height of the wall. Accounting for this from the start will ensure that the wall does not end up too short. If the wall is too high, you may need to embed it deeper in the ground to reach the desired height, this is a little more digging but is otherwise ok. See our retaining wall cost guide to find the average price of a retaining wall. The retaining wall should be set embedded below grade on a level base of 6″ gravel or stone. We recommend making the base twice as wide as the block depth to account for settling. The calculator will estimate this or use our cubic yardage calculator to estimate 6″ of gravel to find how much gravel material you’ll need to order. Ensure that the retaining wall base is compacted and level so that the first course of retaining wall block will be level. The retaining wall should have 12″ of gravel immediately behind the entire length and height of the wall to allow for proper drainage. The calculator above will estimate this or, you can use the cubic yards calculator. Add a layer of landscape fabric between the stone backfill and the earth behind it to prevent the dirt from filling the pores of the gravel, making it less effective. Find how many concrete blocks are needed by entering the size of the wall and the size of the block. Estimate concrete block material and cost.